Nobody can even remember the last competitive race for district attorney in Queens. Outgoing DA Richard Brown, who turns 87 later this year, has held the office since 1991, when he was appointed by Gov. Mario Cuomo. Since then the Queens Democratic Party machine has scared off any primary challengers. But after Alexandria Ocasio-Cortez toppled party boss Joe Crowley last June, the machine no longer seems so formidable. Meanwhile, the successful DA campaigns of Philadelphia’s Larry Krasner and Boston’s Rachael Rollins among others, show that now is the hour of criminal justice reform. The three established contenders in Queens — Borough President Melinda Katz, City Councilman Rory Lancman and retired judge Gregory Lasak — are positioning themselves as reformers on a variety of issues. Lancman, chair of the city council’s Committee on the Justice System, has been a leading critic of NYPD arrests for marijuana and fare evasion (many activists, however, are still angry that Lancman supported the hiring of 1,300 new cops in 2015). Katz, who voted for the death penalty as an assemblywoman in the mid-1990s, is now calling for open-file discovery for defendants and an end to cash bail. And although Lasak is the preferred candidate of law enforcement unions, he does have a track record of helping overturn wrongful convictions. Of the three, Lancman has been the most outspoken in his support for closing Rikers. Katz had been reluctant to take a position, but through a spokesperson tells The Indypendent that “Rikers must be closed, and that borough-based detention centers are a better model for ensuring cases are heard in a timely manner.” Lasak, however, is not supporting the initiative. “I don’t believe where jails are located is within the purview of the District Attorney,” he says. All three figures have won campaigns with support from Crowley’s county machine. In 2013, the party-backed Katz for borough president and Lancman for councilman (representing Fresh Meadows); in 2017, Lasak was re-elected as one of the six State Supreme Court judges on the Democratic line. Although Lancman voted for him to remain party leader despite his defeat by Ocasio-Cortez, Crowley seems closest to Katz. Given that a new DA potentially could shake up the Queens courthouses, the party machine has a lot riding on the late June primary. The new mission, says Cabán, is ‘transformative justice,’ with strong attention to racial and economic equality. The degree to which the new DA will overhaul the office is a major concern for activists as well. On MLK Day at the courthouse in Kew Gardens, the Queens for DA Accountability coalition — which includes Color of Change, Make the Road NY, the Rockaway Youth Task Force and VOCAL-NY, among many other groups — announced a list of policy demands for the new DA to adopt, with a strong focus on police accountability and an end to low-level prosecutions. Andrea Colon, community engagement organizer for the Rockaway Youth Task Force, tells The Indypendent that her group wants the next DA to be someone “who is a genuine advocate for the people of Queens, which may be the most ethnically diverse place on the planet.” Colon and other activists want a dramatic reduction in the myriad DA practices that target “crimes of poverty” and contribute to mass incarceration. Similarly, Daniel Lynch of the Queens chapter of the Democratic Socialists of America (DSA) says the group wants the “DA’s office not to be involved in the over-policing of minor crimes, which will free up resources for prosecutors to go after employers committing wage theft as well as negligent or harassing landlords.” The DSA also plans to focus on the role of money in the race, with a clear preference for Ocasio-Cortez-style small campaign contributions. Scrutiny of the candidates’ money trails raises questions about whether their donors really want reform. Meanwhile, many activists are supporting public defender Tiffany Cabán, a recent entrant into the race. While the Queens for DA Accountability coalition cannot endorse because of its nonprofit status, DSA members in Queens voted overwhelmingly at the end of January to back Cabán and she is expected to receive the support of the organization’s citywide leadership when it convenes on Feb. 10. On the fundraising front, Lancman is at best a mild reformer. He explained to a recent DSA forum that amassing a “war chest” was necessary to order to win. Asked whether he imposes any restrictions regarding fundraising, Lancman tells The Indypendent, “We’re not actively soliciting contributions from the criminal defense bar in Queens. And when I’m the DA, like Cy Vance, I won’t accept contributions from lawyers with pending cases.” That said, attorneys, mostly on the civil side of the Queens courts, have helped fill Lancman’s coffers, contributing $75,000 out of the roughly $600,000 that the councilman has raised specifically for his DA campaign. (Lancman also transferred more than $400,000 from his city council campaign accounts). Lancman has reeled in several donations from business entities, many of which — e.g. the Ferrari Driving School of Astoria ($5,000) — have an unclear relationship to the DA’s office. The $20,000 Lancman received from a mysterious entity called ADJFAM Management also raises questions — especially because that same company was an early contributor to Trump’s 2016 campaign. Various senior nursing homes have also kicked in more than $20,000. While Lancman has collected several contributions from real estate interests, Katz is clearly the preferred candidate of big developers. Shortly after suggesting that the Amazon deal (which Katz supported) should help revive the stalled BQX waterfront trolley project (which she said should be renamed the “QBX”), Katz received $10,000 from Brooklyn’s Two Trees Management, a key supporter of the project. According to campaign spokesperson Daniele de Groot, Katz’s “contributions are evaluated on a case-by-case basis in order to avoid conflicts of interest.” More than $150,000 of the $600,000 Katz has raised directly for the DA’s race has come from real estate players. Like Lancman, Katz will transfer a sizable amount of money (over $300,000) from other campaign accounts. Her donors include several New York City real estate titans, with names like Tishman, Doctoroff, Walentas, Barnett (of Extell Development), and the Dolans leading the list. De Groot says that “along with civic leaders and residents, these business leaders recognize that Queens needs the kinds of reforms that Melinda has proposed [and] seek to be a partner in justice for all Queens communities.” Yet that same elite is most unlikely to give money to anyone they perceive as a potential threat to the status quo. Lasak, meanwhile, raked in more than $800,000 in just over three months. According to campaign manager Danny O’Halloran, Lasak “will not accept contributions from employees of the Queens DA’s office and does a thorough vet of all contributions he receives.” That policy leaves the door open for criminal defense attorneys active in Queens to help fill Lasak’s coffers. For example, Dennis Coppin, who has regularly defended Queens clients (including in Lasak’s courtroom), has given more than $15,000. Even more problematic is Lasak’s sizable haul from law enforcement unions. The New York State Troopers ($35,000) and Sergeants Benevolent Association ($30,000) are his two largest contributors. Lasak tells The Indypendent that he’s “led the investigation and prosecution of law enforcement officers when they violated the law. But these unions are backing me anyway — because I’ve always been fair, honest and impartial.” Those same unions are almost never on the side of criminal justice reform. Her pledge not to take any corporate money — and to seek only small contributions — differentiates political newcomer Tiffany Cabán from the established candidates. (Cabán recently created her campaign account, so her donations will not be listed until the next filing). Cabán also brings the perspective of a seasoned public defender to the contest. “Public defenders are people-focused and take a holistic approach to dealing with their clients and their families,” says Cabán. The 31-year-old Cabán has been a public defender in Manhattan for seven years, the first three with Legal Aid and the rest with New York City Defender Services. Cabán is Puerto Rican and queer. The Queens native grew up in South Richmond Hill and graduated from St. Francis Prep high school in Fresh Meadows. Cabán’s father was an elevator mechanic and her mother a daycare provider. Cabán also pledges to shake up the DA’s office, invoking Larry Krasner’s overhaul in Philly. “If you are not aligned with our priorities and mission, you can look elsewhere,” advises Cabán. 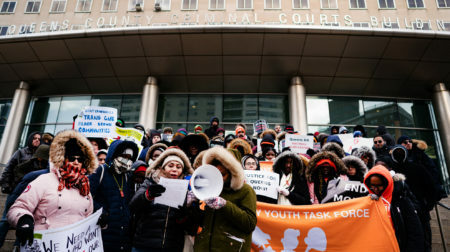 The new mission, she says, is “transformative justice,” with strong attention to racial and economic equality, and it includes restorative justice, because “people who harm most often have also been harmed, and we need to break the cycle.” Like Krasner, Cabán’s unit investigating wrongful convictions would also examine cases with excessive sentencing, faulty cop testimony and dubious plea deals. Cabán is eager to bring the reform agenda to Queens. Rikers, she says, “needs to be closed and the city’s timeline isn’t fast enough. But the proposed new jails are too large and don’t have enough emphasis on rehabilitation and reentry services.” Cabán will no doubt face strong resistance every step of the way, including getting on the ballot (petitioning starts February 26). But her campaign is clearly in sync with the activists’ calls for radical change in the most powerful elected office in Queens. Are you listening, AOC? CORRECTION: An earlier version of this article, online and in the print edition, stated that Gregory Lasak had raised “nearly $700,000” in three months. In fact, he raised more than $800,000. 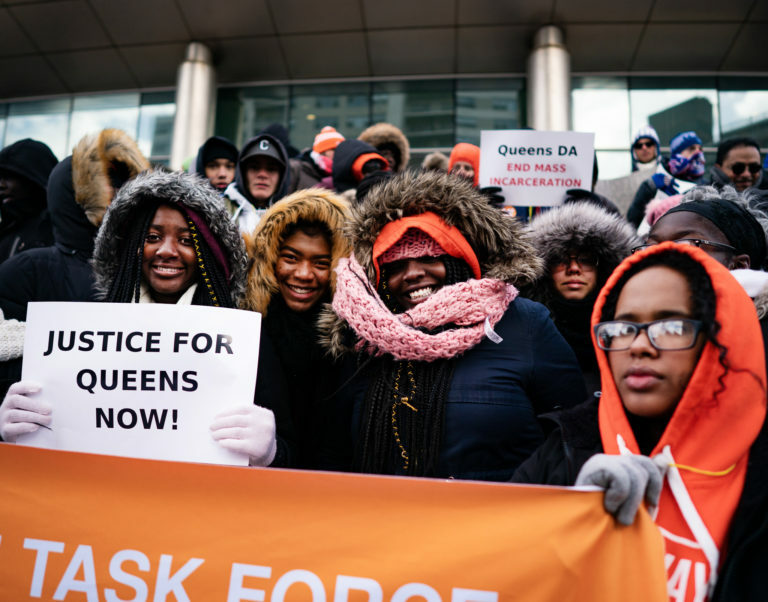 Photo: Members of the Queens for DA Accountability coalition rally outside the Queens County Courthouse on a bitterly cold MLK Day.